As we, together, edge toward the third decade of the 21st Century, there is a growing acceptance of the impact of burning fossil fuels upon the Earth’s climate systems. There will be an incremental transition to an increasingly low carbon economy. The size and by consequence the influence of the Oil & Gas industry based on the UKCS will diminish, perhaps, eventually, to nothing. Yet, as Norwegian Oil giant, Statoil (now Equinor) has put it: The generation that will see the lights go out in the North Sea is yet to be born. The old oil fields are being decommissioned, but new exploration and drilling is taking place. As a new chapter opens, it would appear since the 2015 crash that a more aggressively exploitative, ethos toward the natural resources beneath the North Sea has taken hold. New companies are arriving on the scene, unashamedly declaring that they want to squeeze the assets for maximum profit (and by “assets” they also mean you, the worker). The average offshore worker has no greater asset to sell than the skill of the hand and the practical/technical know-how of the mind. The average offshore worker does not have the wealth or assets of the corporations that dominate the North Sea Oil & Gas industry. But, without the combined skill of thousands of men and women with nothing to sell other than the skills of hand and mind, the flames of the flare stacks in this multi-billion pound industry would be extinguished. Without the worker, the assets are moribund. There will be an incremental transition away from fossil fuels. However, the way in which this transition unfolds can be significantly influenced by today’s offshore workforce. Yet, without real power, there is no real influence. The transition is coming, yet the pace and shape of how that transition will unfold is still to be determined. To have meaningful influence on how the future will unfold, we need to fight for meaningful influence now. 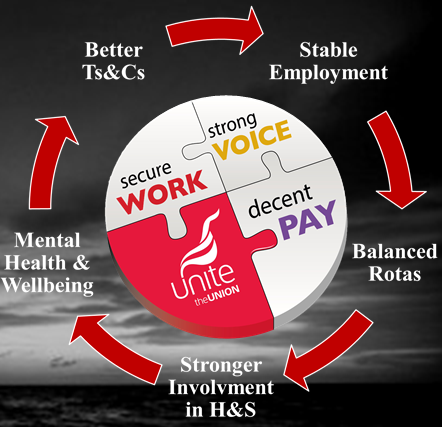 Here, at the start of 2019, Unite is opening up a campaign to put a new, more solid floor under the feet of the offshore workforce. What we stand for is clear: A safer, healthier industry, supported by more balanced rotas and greater security of employment. Throughout the course of the year we will also be examining the strengths and weaknesses of existing offshore agreements. If we are to influence the shape of the future, we need to show that we have the power to effect meaningful change now. Throughout the course of this year we will be asking for you to get active and get involved. You can be a spectator to a future that is written for you or an author of what is written. A better future is possible, if you choose to fight for it.